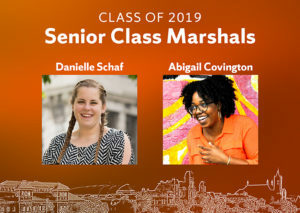 Abigail Covington and Danielle Schaf have been named Senior Class Marshals for the Class of 2019 by the Division of Enrollment and the Student Experience, which oversees the selection process. Covington and Schaf will lead the Class of 2019 and carry their class banner to open Syracuse University’s 165thCommencement ceremony. From Shelby, Nebraska, Schaf is a triple major in the College of Arts and Sciences and the Maxwell School, majoring in anthropology, forensic science and writing studies, rhetoric and composition. Schaf is also in the Renée Crown University Honors Program and has earned Dean’s List honors every semester. Read more about Schaf and Covington here!